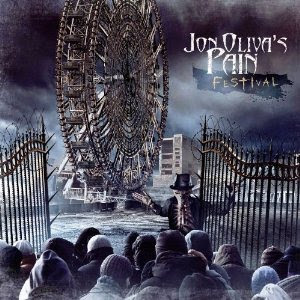 Hall of the Mountain King: Review: Jon Oliva's Pain, "Festival"
Review: Jon Oliva's Pain, "Festival"
I’ve been a fan of Jon Oliva since the first time I heard Savatage, and I honestly don’t think that anything he’s ever touched has turned out remotely bad. (OK, I do try to block out Fight for the Rock). In my mind, he’s one of only a handful of creative geniuses in metal, and he never seems to sit still. He took Savatage from a traditional metal outfit to a symphonic metal force working with producer Paul O’Neill and has even transitioned the basic Savatage sound into commercial success with the symphonic rock spectacle of Trans-Siberian Orchestra. Even still, the transition that he’s made with his new outfit Jon Oliva’s Pain has been fascinating to me. After starting life as an attempt to recreate the early sounds of Savatage on 2005’s ‘Tage Mahal, the band has put out four albums with an ever-increasing progressive feel, creating a sound that at once sounds like Savatage, yet completely different. I thought Oliva’s last outing, Global Warning, was a work of pure genius. I’m not quite as blown away initially by Festival, but it’s grown on me with each listen. The music here gets a bit more progressive, but not in the Dream Theater-influenced vein that most people think of as prog metal these days. This is an earthier variety of progressive with heavy flavors of the 1970s acts that influenced Oliva. Jon Oliva’s Pain reminds me in a lot of ways of Queen, not necessarily in sound, but in the overall approach to the music – nothing is really out of bounds, be it raging metal, soft introspective pieces or even show tune theatrics. That, of course, has been a hallmark of Oliva’s work over the years. Fans of Oliva’s work will also expect a few ballads and shouldn’t be disappointed by the ones here. I’m not a big fan of ballads, but Oliva always has a deft touch with them. The soft songs are more guitar driven than the piano ballads that he usually delivers. “Looking for Nothing” has a bit of an odd sound that’s a blend of Southern rock attitude and Pink Floyd-style art rock. It’s a strange brew, but I like it. “Winter Haven” is a bit of a faux ballad, opening with an acoustic piece that builds through alternately soft and soaring moments before moving into a more symphonic rock mode about halfway through and bringing in some proggy synth runs toward the end. Album closer “Now,” puts the focus back on Oliva’s piano with a nice string arrangement and almost a Beatles flavor in places. For me, though, the centerpiece of the record is one of those songs that falls in between rock and ballad, “Afterglow.” It has a great opening groove and some tasty lead work by Matt LaPorte, who really shined on the last album and continues to make an impact here. From there, the song drops to a soft acoustic number with piano and strings that remind me of some of the better moments on Global Warning. It builds back to a dramatic bridge with a Streets feel and a catchy chorus harmony that’s nice, though not quite as tight as the harmonies that Savatage fans may expect. There’s no denying that Oliva’s voice isn’t quite what it was back in his prime. It’s lost a bit of its clarity and seems a bit more haggard and weary at times. That said, it’s still quite powerful and distinctive. The wizened tone seems to fit the direction of Jon Oliva’s Pain just as smoothly as his shrieking, maniacal vocals of old fit the style of early Savatage. I’ll still take a 50-year-old Oliva over any of the young guns on the power metal scene. In short, Festival is another solid entry in Oliva’s impressive catalog of recordings, delivering everything his fans expect and then some. Review: Masterplan, "Time to Be King"
Review: Exodus, "Exhibit B: The Human Condition"
Review: Avantasia, "Angel of Babylon"
Review: Avantasia, "The Wicked Symphony"
Review: Hank Williams III, "The Rebel Within"